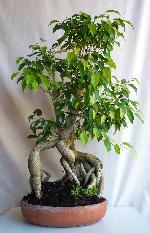 The health of a Bonsai depends on many factors and a key one is the soil in which it lives. When you buy a pot plant it is already in a soil mixture. If you purchased it from a general garden nursery, the potting mix is usually a basic one and the plant is not anticipated to live in a pot all of its life, rather it is expected to either be repotted into a quality potting mix or placed in the ground. Consult gardening books, the Internet or simply ask nursery staff about the correct soil type for the Bonsai tree which you are purchasing. Bonsai soils are composites of the basic requirements but are also specifically formulated for long term plant life in a potted environment. Although soil is one of the key factors determining the health of a Bonsai, the watering regime is just as essential. 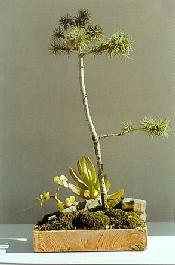 A Bonsai pot is a miniature garden bed, but it requires watering more often than a garden bed as it is much smaller. Small organisms live in it and they help to feed the Bonsai tree. Bacteria break down the soil content into minerals which the plant roots can absorb. 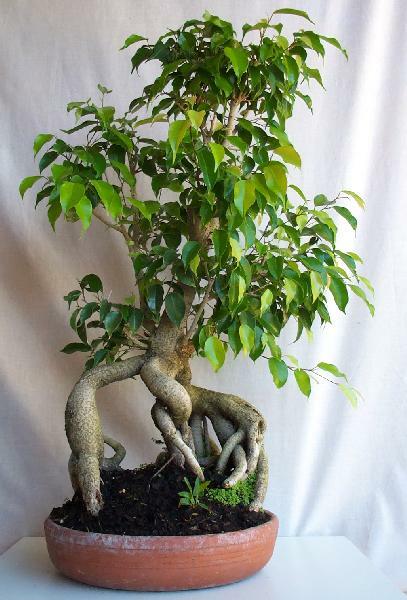 Roots can only absorb these minerals if the soil is moist because the minerals need to mix with water first, so if the soil is too dry then the Bonsai can't feed. Now roots not only absorb water but they also breathe and need fresh air around them so that they can grow. If the soil is too wet the roots can't grow and the Bonsai will become sick. It is apparent that we need to maintain a balance in soil moisture. To test, simply place a finger into the soil and rotate it, then remove and see if soil particles are adhering to it. If the finger is dry and clean then the soil is most likely too dry. If the finger is wet then the soil is too wet. If the finger is damp and covered in little soil granules then the soil is in the best condition. As well as soil composition and moisture content, sunlight is also a key factor to Bonsai health. The green parts in the leaves of trees contain chlorophyll and it is a combination of chlorophyll, carbon dioxide gas and sunlight which gives the tree the ingredients to manufacture organic molecules - food. Light in a room is not the same as outside sunlight. Leaves of trees need sunlight so that they can photosynthesize and produce food. Not enough sunlight and the tree will wither, too much and it will burn. Find the balance for your Bonsai tree and it will be happy. 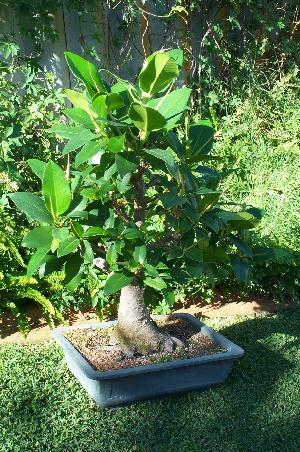 From November to around April in Western Australia, the summer sunlight is very strong, so keep your Bonsai in the shade for a good part of the day and unless it is a specific indoor variety, don't stop it from getting some sunlight or it will get sick.